LAS VEGAS – LeBron James' days of playing for Team USA have likely ended. 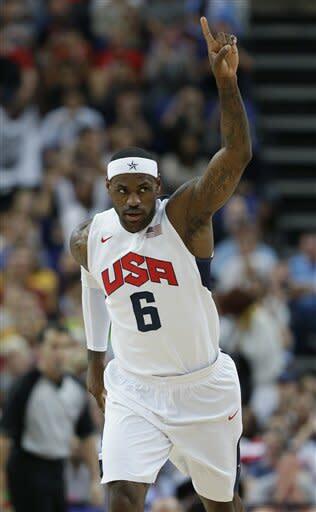 James, 28, will not play for USA Basketball during the 2014 world championships in Spain and is doubtful to participate in the 2016 Olympics in Brazil, a source close to the Miami Heat forward told Yahoo! Sports on Wednesday. USA Basketball executive director Jerry Colangelo also confirmed to Yahoo! Sports he doesn't expect James to play next summer – and doesn't plan to ask him. James has already won two Olympic gold medals and a bronze in three Olympic appearances that began in 2004. James would benefit from more offseason rest as he gets older, especially given how many playoff games he's playing. He's made three consecutive trips to the NBA Finals and played in a combined 99 NBA games last season after taking part in the 2012 London Olympics. Since winning his second straight title with the Heat last month, James has had a busy summer with trips to China and the Philippines, commercial shoots, his prep basketball camp in Las Vegas, business meetings – and planning for his upcoming wedding. "The only way I could see him playing in the Olympics is if his country really, really needed him to play," the source said. "But hasn't he done enough?" Another sign that James' international playing days are nearing an end: Colangelo proclaimed Kevin Durant as "kind of the face of USA Basketball going forward" to reporters after Wednesday's minicamp practice. Durant and Kevin Love announced they will play for the U.S. next summer. Colangelo said he expects another "two or four" members from the past Olympics team to play next year. Durant said he expects Russell Westbrook and James Harden to play next year. Kyrie Irving and Paul George, who participated in this week's minicamp, also are expected to be on the team. James might not be the only U.S. veteran to stop playing internationally. Kobe Bryant is 34 and coming off season-ending Achilles surgery. Dwyane Wade (31), Chris Bosh (29) and even Chris Paul (28) also could want to cut back their time on the court after the NBA season ends. "Those guys are getting older," Durant said. "Their time is precious." Colangelo has not asked James about the 2016 Olympics, but would welcome him if he changes his mind and decides to play. "I don't think he will ever too old," Colangelo said. "He can be 40 and still be able to play. Think of what he might be able to accomplish in terms of legacy with one more medal. "We'll cross that bridge later."